Dollar Tree is a different kind of animal. Family Dollar burden sparks management store closings and renovations. Share values on a tear from oversold to overbought as Dollar Tree stock soars. Analyst upgrades portend continued strength in Dollar Tree stores and an improvement in Family Dollar stores leading to top line growth in 2019. Dollar Tree (DLTR) operates retail discount stores in the U.S. and Canada under the names of Dollar Tree, Family Dollar and Dollar Tree Canada. Human nature loves a bargain; it's a positive reinforcement that begets an action, coming back for more. For Dollar Tree (DLTR), it's the secret sauce in the recipe for a large segment of the population that is cost conscious. Cheaper prices may also be a driving factor that made Walmart and Amazon the dominant retailers they are. But neither of them offer needed merchandise for a buck. But Dollar Tree does! Perhaps mistake is too strong a word, but Dollar Tree's acquisition of Family Dollar in 2015 has proven to be a disappointment for the company. 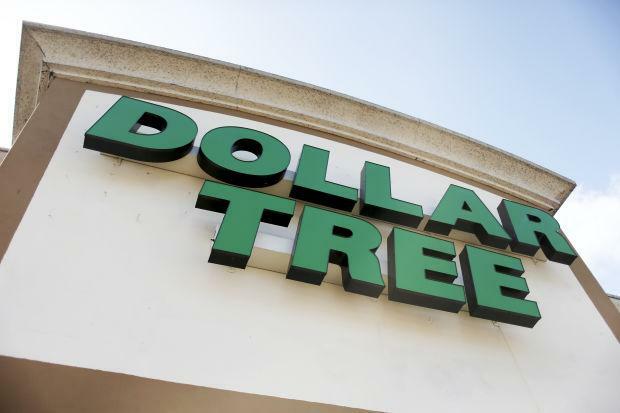 First, the Market thinks that Dollar Tree clearly "overpaid" for Family Dollar, a discount retail segment, that lagged Dollar Tree in same store sales during 2018. Family Dollar's same store sales rose by only 0.1%, while Dollar Tree's same store sales increased 3.3%. Family Dollar has been a burden on Dollar Tree sales growth and overall performance. This result is alarming to management triggering a planned closure of as many as 390 underperforming Family Dollar stores. Additionally, a shift of 200 Family Dollar stores to the Dollar Tree banner and also renovating 1000 others is now part of an effort to optimize store sales. The renovation of Family Dollar stores is dubbed the H2 format which adds new merchandise and includes many Dollar Tree items priced at $1.00. Other plans include placing adult beverages in 1000 stores and providing more freezer and cooling units in 400 others. Investors have cheered new plans to "fix that unit", and fired-up investor optimism is causing the stock to jump as seen in the weekly stock chart below. Notable price action on August 27 toppled share values from a recent high of 96.09 to a closing low of 80.51, a loss of 16.2% in two weeks. 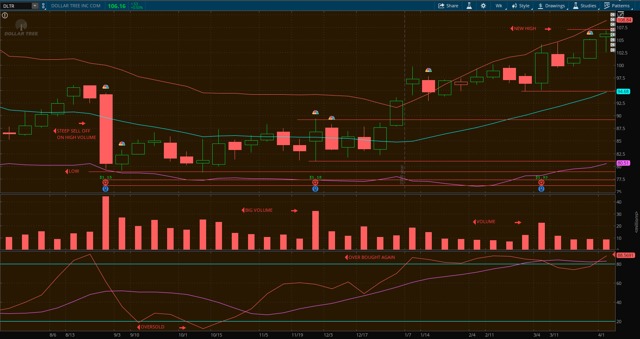 As seen in the stochastic below, this began a slide from an overbought condition to oversold within a few weeks. Share value remained oversold for five weeks when a pop in the price to 81.14 began an accumulation that has continued to the present peaking with a highly overbought stochastic of 88.92 on April 1. Simultaneously, price action grew from 81.14 to 106.18 at this writing. This represents an increase of 23.5% during the interim time period since August. Analysts price targets for Dollar Tree range from a low of 92.00 to a high of 120.00 and provide positive sentiment about the stock's value. In the graphic above, the average for the range is 109.12 compared to actual price of 105.98. 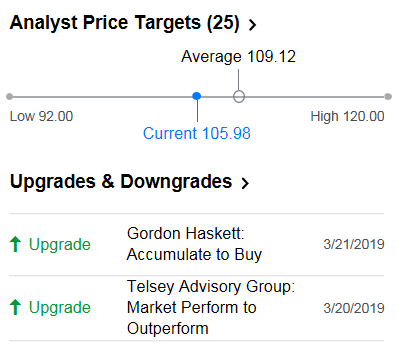 Two recent upgrades underscore current price action. This is confirmation that Dollar Tree management's plans are currently well received. "On March 11, UBS raised its target price for Dollar Tree stock to $120 from $105. As of March 20, the 12-month average target price for Dollar Tree stock was $108.48, which implies a potential rise of ~7%." "Analysts expect continued strength in Dollar Tree stores and an improvement in Family Dollar stores to drive the top-line growth in fiscal 2019." "Net sales expectations are $23.45 billion- $23.87 billion with fiscal EPS expectations at $4.85-$5.25." Activist shareholder pressure to increase the $1.00 price point. Trade disputes with China that increase U.S. import costs. A company that investors see in transformational turnaround mode is a tricky proposition to gage. From the standpoint of current stock price movement and momentum, analysts have given a green light with share value up 23.5% since late August. But this kind of momentum has produced a very overbought condition that has sharply driven share value up. So, IMO, this engaging continuing story must be carefully watched looking for good buy points because I expect some profit taking. Will Dollar Tree be successful in completing ongoing closures, renovations and remodeling plans that increase 2019 sales growth and eliminate the 2018 Family Dollar financial drain? Will expected 2019 growth materialize? Clearly, this is the road management has chosen to generate greater sales and margins. The choice to get on is yours. And lastly, IMHO, if Dollar Tree can hold to the $1.00 price point, they will remain that "different kind of animal" in the retail jungle. To stay tuned, please click on follow. Disclosure: I am/we are long DLTR. I wrote this article myself, and it expresses my own opinions. I am not receiving compensation for it (other than from Seeking Alpha). I have no business relationship with any company whose stock is mentioned in this article.